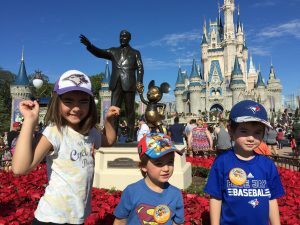 Before Christmas, we took the kids to Magic Kingdom and Disney’s Hollywood Studios. I knew it was going to be an overwhelming experience to be at these parks at such a busy time and with our three excitable kids. I even asked for prayer the day before our visit to Magic Kingdom. I was terrified that we were going to be in such a magical place and I was going to be so Sneezy, Dopey, Bashful, Sleepy, Happy, Doc, GRUMPY! trying to control my children from running around like crazy people. The kids in front of Cinderella’s Castle. The morning we walked into Magic Kingdom, I was overwhelmed… overwhelmed with utter awe and joy. All of Main Street was decorated for Christmas (my favourite time of year), there was Christmas music playing and then, under the biggest Christmas tree I’ve ever seen, there he was… Experiment 626. He is fire-proof, bullet-proof, and can think faster than a super computer. He can see in the dark, and lift objects three thousand times his size. His only instinct… to destroy everything he touches. He’s irresistibly drawn to large cities, where he will back up sewers, reverse street signs and steal everyone’s left shoe. I couldn’t get a photo with my favourite alien, because he had to go backstage for his lunch break… But within minutes of arriving on Main Street, the Move It! Shake it! Dance & Play It! Parade went by where we danced and waved to Donald Duck, Minnie Mouse, Woody & Jessie, Chip & Dale, Nick & Judy, Goofy, Baloo & King Louie and Mickey Mouse. It was full of bright colours, fun music, great dancers… It was a huge party that floated by and set the tone for the rest of the day. We continued to walk down Main Street towards Cinderella’s Castle. As soon as we arrived in front of the Castle, we were greeted by Mickey, Minnie, Donald, Daisy and Goofy on the grandest stage in front of the Castle. Mickey’s Royal Friendship Faire had just started and we were treated to Princess Tiana and Prince Naveen performing Dig a Little Deeper, Rapunzel and Flynn Rider performing I’ve Got A Dream and Queen Elsa, Princess Anna and Olaf performing Let It Go. Stitch! My dream come true! All of this magic happened within 2 hours of arriving at the Magic Kingdom–so much magic concentrated into so little time. Our senses were on overdrive with all the music, decorations, turkey legs, cotton candy and stuffed animals. The rest of our day was just as special: we saw Aladdin and Jasmine, the kids swore an oath to Captain Jack Sparrow to become pirates who will serve as part of his crew, we saw Mary Poppins, we danced with Mr. and Mrs. Incredible at the INCREDIBLESSuperDanceParty, we met Buzz Lightyear, we helped Belle recreate the night she fell in love with the Beast, we met Rapunzel, Princess Tiana, Cinderella and Elena of Avalor and we celebrated at the 3pm parade which featured the best of the best, Cinderella and her Prince, Belle and the Beast, Rapunzel and Flynn Rider, Elsa and Anna, Maleficent, Aurora and Prince Charming, Tiana and Naveen, Peter Pan and Tinkerbell, Ariel and Merida. Our day was full of magic, excitement and the most memorable fireworks I’ve ever seen. Magic Kingdom swept me away with it’s perfect charm and enchanting delightfulness. Elsa even froze Cinderella’s Castle with her magical, icy powers. A week after we went to the Magic Kingdom, we took the kids to Disney’s Hollywood Studios. I knew Jenson would love our time there because this park was largely focused on Star Wars. What I didn’t expect was how much I would love our time there. 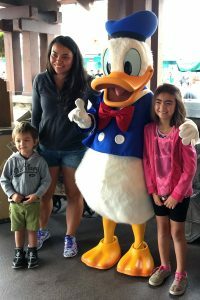 Once we arrived, there was an extremely short line to meet the most dashing, Donald Duck, so of course, we lined up and thought about questions to ask him… Like, why do you wear a shirt, but no pants? Or, how does it feel to be over-shadowed by a mouse? Ultimately, we just chose to give him hugs. The dapper and dashing Donald Duck. After Donald shared some kisses, were immediately in the middle of the March of the First Order–a squad of 14 Imperial Stormtroopers marching down Hollywood Boulevard, led by Captain Phasma. It was so much fun to watch, but also extremely menacing–the music, the uniforms, the lack of facial expressions. The kids were extremely excited about seeing Stormtroopers in person, especially since Isla, Jenson and Luke went to see Rogue One the day before. We had some lunch and lined up to get a front row seat for the next March of the First Order and to watch the Star Wars: A Galaxy Far, Far Away show a few minutes later. The show featured most of the beloved characters from the movies, C-3PO, R2-D2, Darth Maul, Bobba Fett, Chewbacca, Kylo Ren, Darth Vader and BB-8. Later on in the evening we met Kylo Ren, who was extremely intimidating and showed absolutely no remorse for killing his own father. He even tried to recruit the kids into training for the Dark Side. We met Chewbacca too, who desperately tried to win Lincoln over, but failed and complained to Isla about it. After we took our photo, he handed the kids an Aurebesh to English translator and Lincoln let his guard down enough to give Chewie a high-five. Chewie was also very impressed with Luke’s Wookie battle cry. My two favourite experiences at Disney’s Hollywood Studios were For the First Time in Forever: A Frozen Sing-Along Celebration where two royal historians recount the windswept story of Anna, Elsa and Arendelle. We watched classic moments from the movie and sung along to the most popular songs including Do You Wanna Build a Snowman, For the First Time in Forever, Love Is an Open Door, In Summer and Let It Go. Elsa also made it snow, which made everyone’s day. It was hilarious and so sweet, and made me declare Princess Anna as the best Princess ever. 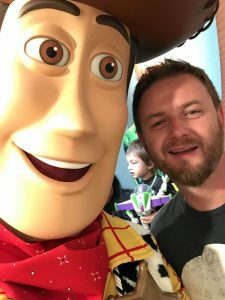 Woody taking a selfie with Luke. My other favourite experience was meeting Buzz Lightyear and Woody. Earlier in the day, Lincoln bought a Buzz Lightyear toy with his Christmas money–complete with phrases, laser beam and karate shop action. Later on in the evening, when we met Buzz and Woody, Buzz just loved that Lincoln had the toy version of him. They spent a good chunk of time interacting with the kids and to top it off, when Luke pulled out his phone for family photos, Woody stole it and proceeded to take a crazy amount of selfies. We met Moana in her waterfall cavern and asked her how she found the courage to restore the heart of Te Fiti, we met some of Andy’s Toy Soldiers, we met Olaf–the cutest snowman in the entire world, we watched Indiana Jones perform dangerous, death-defying stunts and Isla traded with a Jawa who gave her a very valuable droid head in exchange for a glittery gem. Respectfully, the last characters we met were Minnie and Mickey. Minnie was so sweet and gave all the boys kisses on the cheek. Mickey gave all the ladies a kiss on the hand, and just couldn’t help himself from attacking Lincoln with another smothering hug. This day was also filled to the brim with magic and wonder. We all had so much fun interacting with the characters and going on rides. This day filled our imaginations with marvel and filled our memories with sweet warmth. When it was time for us to leave Ian’s house we decided to head to Celebration for a few nights before heading south to the Everglades and the Keys. On the drive toward Celebration–which we found out is a town that Disney bought and attempted to turn into a utopian neighbourhood–we passed some Disney signs, both Luke and I got the yearn to go back and recapture the magic. The pull to experience the magic again was so strong, we just couldn’t resist the chance of getting to encounter more overwhelming charm. In all honesty, both Luke and I were a little sheepish about our feelings because we each had those feelings separately, but didn’t share them with one another until the day after we arrived in Celebration. Since we weren’t going to spend another insane amount of money to visit a park again, we settled on just watching the Magic Kingdom’s Wishes Nighttime Spectacular fireworks show from a nearby location. While I was researching where we could watch the fireworks from, I stumbled upon a website that mentioned that non-guests can visit any of the Disney resorts. An entirely new world of Disney just opened up to us and we hustled to Disney’s Polynesian Village Resort to have some dinner and watch the show from their beach. The fireworks were just as magical as I remembered, but this time we got to watch them while sitting on a beach, as Disney’s Electrical Water Pageant floated by, while eating a Dole Whip. After the fireworks, we took a round trip on the famous Disney Monorail, to visit the other resorts on the loop, from the Polynesian to the Grand Floridian, to Magic Kingdom, to the Contemporary, to the Transportation and Ticketing Centre and back to the Polynesian. 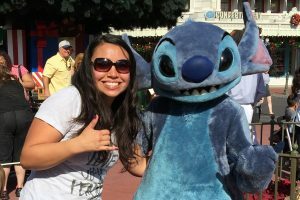 The Polynesian was by far the best out of all the resorts because it had that Hawaiian charm, it had all the Stitch merchandise a girl like me could ask for (Truth be told, there’s no amount of Stitch merchandise that could ever satisfy.) 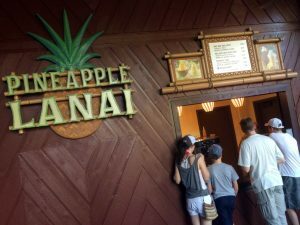 and it had a Dole Whip counter. While we were exploring the southern part of Florida, we just couldn’t escape our yearning for Disney. One night I was checking Instagram and an account called @doingdisneythings liked one of our photos. Intrigued by their account name, I started going through their feed and I found a photo of them hanging out at an elephant graveyard. Not just any elephant graveyard… THE elephant graveyard. It was location tagged at Disney’s Art of Animation Resort, so I checked out more photos from that location on Instagram. I was instantly bombarded by an entire resort dedicated to making The Little Mermaid, The Lion King, Finding Nemo and Cars come to life. I checked out the resort website and my mind exploded… I even uttered the words, “I don’t know what is happening to me, but I’m completely blown away by this hotel.” to Luke, who laughed. Overwhelmed by Disney, once again, we decided to book two nights at the resort and enjoy everything it had to offer. We stayed in The Little Mermaid area and the shower in the room was Ariel’s Grotto! They paid such great attention to little details for each movie theme and in the themed rooms. They had a beautiful big blue pool with a Finding Nemo theme, there were jellyfish, the P. Sherman 32 Wallaby Way mask and there was music playing under the water in the pool. Under the water you guys! They even had the seagulls on a perch and they would shout, “Mine! Mine! Mine!” every half hour or so. The Lion King section had the Elephant Graveyard playground, complete with the hyenas, and a great statue of Mufasa on Pride Rock. The Cars section was my favourite because of how much they made it look like Radiator Springs, the pool was set up to look like Sally’s Cozy Cone Motel and there were Cozy Cones for guests to use as cabanas. Our whole time there was filled with excitement and wonder, everyday we noticed something new. Beyond the two parks we we went to, the three resorts we visited while at Celebration and the Art of Animation Resort we stayed at, we visited several of the other Disney World resorts… Caribbean Beach, Pop Century, Fort Wilderness Lodge, Animal Kngdom Lodge, All-Star Movies, Old Key West, Coranado Springs and Art of Animation. My favourites were the Polynesian because I love Hawaii and I love Stitch, Animal Kingdom Lodge because it was breathtakingly beautiful and they have giraffes and zebras, and the Art of Animation because it was pure magic. Once it was time for us to leave Florida, we wanted to enjoy the Wishes Nighttime Spectacular fireworks show one more time. We took the boat from the Polynesian to the Magic Kingdom, scoped out a good spot to watch the fireworks and hear the music and enjoyed one last night of magic. I couldn’t keep myself from being overwhelmed with emotion, the end of the magic. That Jiminy Cricket singing When You Wish Upon a Star made tears come out of my face. 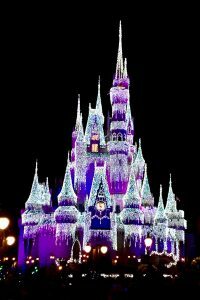 Everything about our time at Disney World, from the parks to the resorts was filled with enchanting charm. Every time we passed through the Walt Disney World gates on the highway, I was transported into a younger, more exuberant self… Eager to run around the corner to find a new adventure, to get lost in my imagination of these lovable characters actually come to life. I was able to let go of adulthood to indulge in my extended childhood and because of that, there was no longing unmet. My heart actually ached when I knew we had to leave. I can’t exactly put a finger on why I loved this place so much, but I do know that Disney made me feel like a kid again… when my imagination was filled with ideas of wearing Belle’s lavish, yellow dress, or flying on a magic carpet with Aladdin, or finding grubs to eat with Simba. No thoughts about laundry or dishes or cooking–just Hakuna Matata. It was a pure kind of happiness that came from childhood, the kind of giddiness that came from closing your eyes as you went back and forth on the swing. I had about a 0.0001% taste of what it will be like to enter the Heavenly Kingdom. I have warm memories of Disney movies throughout my childhood and teenage years, and having the opportunity to come face to face with the characters I fondly held in memories was so cheerful. In comparison, I’ve studied God’s word and lived in communion with Jesus for almost half of my life, and by the time I’m able to touch his scars and look into his eyes of grace I won’t be able to contain my joy. Imagine knowing someone so intimately, but never being able to see them face to face until after you fall asleep and wake again. What a joyful day. I also feel like I can understand a bit more about what Jesus meant when he said we are to be like children. Free of doubt, free of fear, free of judgment. The chance I had to shed my adulthood insecurities for a cloak of childhood innocence provided real insight for me to become closer to the child of God I’m called to be. No doubts, no fear, no judgment. Just joy, just exuberance, just eagerness. Every moment at the park was covered in pixie dust, from literally hearing music everywhere you went* to the woman whose job it was to clean up after the horses, following those steeds with her broom and dustpan, dancing, singing and smiling joyously. Everyone who worked there always had huge smiles on their faces, they were deeply dedicated to maintaining the inescapable magic of the park. Everything was immaculate and whimsical, you almost felt overwhelmed by it’s perfection. Every last detail was perfectly looked after–not an ornament, light or pair of mouse ears out of place. It was a fully encompassing experience, no detail too small, no wish too big. Disney World truly is the most magical place on earth, the place where dreams come true. Especially the dreams you didn’t even know you had. *I’ve read that it’s a rule Walt Disney had, that you couldn’t be anywhere in the Magic Kingdom without being able to hear music. It only adds to the magic. For more photos from Magic Kingdom, click here. For more photos from Disney’s Hollywood Studios, click here. 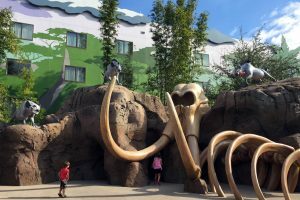 For more photos from Walt Disney World Resorts, including our stay at the Art of Animation Resort, click here. Previous post His Word is His Will.